Tracy and her husband Dave set out together to Myrtle Beach when they were both just nineteen and have made a pretty good run of it down here. 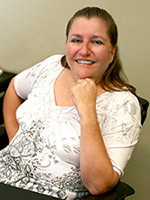 Dave has owned and operated an income tax and accounting practice since 1994, which Tracy helps out with part-time. (She even ran her own mortgage broker firm from 2003 to 2009.) Her considerable experience in purchasing, accounting, and inventory control has quickly proven valuable here at Smokingpipes, where she thoroughly enjoys being able to utilize her skills—she also thoroughly enjoys our dressed-down environment. Tracy's passion for her work is evident; she's always eager to volunteer with new projects, and encourages Laudisi-spirit through every meeting and event. When they aren't busy with, well, business, Tracy and her husband enjoy getting out and back to nature, camping and hiking with their three children.